Karin Rodland learned to fly at Aurora Aviation in 1993, earned her instrument rating in 1999 and her commercial rating in 2006. 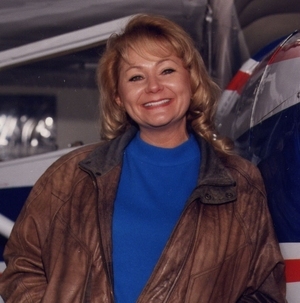 Over time, Karin has been an owner or part owner of a Cardinal 177A, a Beech Debonair, a Piper Warrior, a Cessna 182 and a Cessna 140. The C140 makes Karin an unofficial member of Ladies Love Taildraggers. Karin has been a member of the Mid-Columbia 99s since 2003, and has served as Mid-Columbia Chapter Chair, and Northwest Section Scholarship Chair and Nominating Committee Chair. Karin also flies for Angel Flight West, and is a Mission Orientation Pilot who is able to give, provide and certify the initial mission orientation checklist for Angel Flight. Karin's day job is working as a biomedical research scientist at Pacific Northwest National Laboratory, and she also holds a joint appointment on the faculty of Oregon Health & Science University. Flying that 182 comes in handy when commuting between Richland WA and Portland. Patty Mitchell has been a member of The Ninety-Nines for over 40 years. She first joined The Ninety-Nines in Houston in 1979 and was there until she joined the Montana chapter from 1979 to 1992. At that time, she transferred to the Idaho chapter where she is currently a member (although she lives in Columbus, MT). She has been a professional pilot for 41 years which included being a flight instructor, charter pilot, airline pilot and FBO owner. She is a Gold Seal CFI, II. 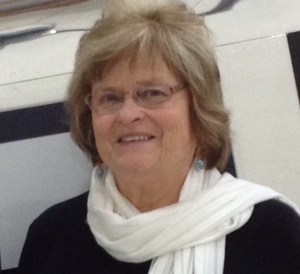 Patty has worked for Montana Aeronautics as director of search and rescue and conducted mountain search-pilot seminars and other various safety seminars in the state. She also has written articles for the state Aeronautics newsletter. Patty's aviation background includes being the first woman pilot to be hired by Metro Airlines and flew Twin Otters. She also was the first woman smoke-jumper pilot for the Forest Service on contract in 1980 out of Missoula. For 15 years, Patty flew for United Airlines as pilot flying 747 and 747-400s until she retired in 2003. For six months, Patty lives on a boat with her husband, Robert and Maggi Montana, and Wonder Dog of the North, traveling to the Bahamas, Florida, Texas and the Great Lakes. She also is a proud mother and grandmother. Aviation is in Erin's blood and spirit! Her grandfather taught Avionics Maintenance for the United States Navy in World War II, and her mother earned her private pilot certificate in the 1960s. In January 2015 Erin began flight school, which led her to the Mid-Columbia 99s chapter. She received a Fly Now award to help her finish her private pilot’s license in 2016. Her goal is to build better connections with the 99s and to inspire the next generation of aviation. She also works as a Washington State 4-H Advisory Board member and is secretary for her Order of Eastern Star Chapter (Alma #100). Erin works in the agricultural industry as a crop consultant to fund her aviation habit. Aileen passed her checkride to become a private pilot in February 2018 and is excited to expand her flying adventure and share it with her family and friends. She joined the Ninety-Nines over two years ago and has been overwhelmed by the support provided by such an exceptional group. Aileen is a licensed Certified Public Accountant and currently works as Financial Administrator for Benton County in Washington State. Her employment experience includes working in the “accounting trenches” to Chief Financial Officer. She earned her accounting degree from Whitworth University in Spokane, Washington, where she grew up. Aileen has served on several boards including the local chapter of the Red Cross and her homeowner’s association. Currently, she is the secretary for the Mid-Columbia 99s. Stacey started working for the local Mosquito Abatement District prior to getting her private as a right-seat spotter in the spray plane. Not long after, she purchased her first plane, a 1956 Piper Tri-Pacer 150, and started hauling supplies into the Idaho backcountry and spraying mosquitos from a modified C182 with spray booms and a belly tank attached. She flew ag operations in Ag Cat, Weatherly and Pawnee Spray planes. Stacey joined the Idaho 99s in 1993 and is a past chapter chair, past international 99s director, and Amelia Earheart Scholarship recipient in 2011. The owner/operator of a 1958 Cessna 182 since 1996, Stacey is a current CFII, MEI rated and OAS carded. She is the broker and owner of Delta Land Real Estate Company, started Idaho4Homes.com and has been licensed as a realtor since 1994. It's a passion of hers to promote aviation and the 99s to every woman and especially young girls, often giving presentations to grade school children and donating all her flight magazines to the kids. Elizabeth Harris zips around in her own RV6A, small, fast, 2 seater. Pearson Airfield is homebase, member of Columbia Cascades 99s. Director for the Northwest Section (2017-2018). When not flying, Elizabeth is mentoring the fantastic staff of her company: Mercy1 Transportation, coaching and encouraging them to excellence. Gardening is another passion, flying to a garden tour would be a dream come true. Patty started flying at the University of Illinois, first in gliders and then in powered aircraft. She completed her ASEL and 37 years later added her glider rating. Patty first became a 99s Oregon Pines member in 1982, worked 33 years in aviation, and was a member of other 99s chapters. She rejoined Oregon Pines chapter after retiring. She lives 15 miles southeast of Salem, OR, on the ILS approach, and under a PDX arrival route--life is good!